Recommendation: Dirt Cheap sweet wine that pairs well with hot spicy food. 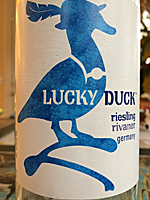 Winery/Producer:Bottled by Luck Duck Winery; Livermore & Ripon, California. Purchased From: Walmart; Kernersville, North Carolina. Paired With: White chili, medium hot; cabbage salad with oil and lemon dressing. He said: Chilled before opening. Clear, almost colorless with just a hint of lemon yellow. No aromas. No taste, but a cool (the bottle was chilled) syrupy sweet short finish. Now with that said, it went well with the hot spicy chili. Drinking alone IT WAS TERRIBLE!!! However at only $3.97 it’s probably as good a drink as beer with hot chili…because you can’t taste anything and all you want is a cold drink, and in this case the sweet cold was good. But the big question…would I buy it again; maybe, but only when we have similar hot spicy dinners where you can’t taste what your drinking and didn’t want to waste a “good” bottle of Riesling. She said: This wine was a good example of turning a sows ear into a silk purse. We always have a hard time pairing a wine with a hot spicy dinner and hate to spend a lot of money on a wine I can hardly taste because my taste buds are bruised from the heat. This wine was absolutely delicious with the chili; not great with the salad (no surprise). After dinner sipping alone the super sweetness of the wine was dominant and since I am not partial to sweet wine I was not impressed. Other issues included a lack of bouquet and flavor and a mercifully short sweet finish. Perhaps Yucky Ducky is the best name for this wine!!! At $3.97 I recommend it if you are having a hot spicy dinner or like tasteless wine. A hot spicy dinner doesn’t need a big bold flavor so why not grab a wine that tastes good with the food? I am urging Ray to buy more of this so I can have more of my old favorite hot spicy dinners with no recriminations. Perhaps other inexpensive Riesling would be just as good with this dinner and I hope to find out. What a great discovery it would be to find a $4. Riesling that went well with a hot dinner AND was good alone.